You need a visa for Bhutan: we will apply for the visa on your behalf. The cost of the visa will have been included in your tour price. Airport departure tax (service charge) is included in your air ticket. It is no longer necessary to pay at the airport. The currency in Bhutan is called the Ngultrum. 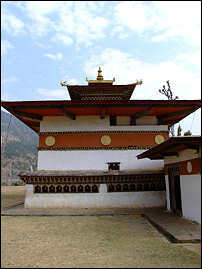 It has the same value as the Indian Rupee and although the Indian Rupee is used widely in Bhutan, the Ngultrum cannot be used outside Bhutan, for example in India. At the time of writing £1 = 93 Rupees/Ngultrums approx. US$1 = 63 Rupees/ Ngultrums approx. There is little value obtaining Rupees in the UK, it is best to buy what you need on arrival, for example by changing pounds or dollars at your hotel. Change only small amounts to cover your immediate needs. The US dollar is also universally accepted. Sterling can readily be changed to Ngultrums in most hotels. In summary, we recommend you carry US dollars or sterling bills and a credit card. Remember also that the only money you will require is for drinks, or incidentals as all your meals will probably be included in your package. Although Bhutan has a mobile phone network, UK cellphone companies do not have reciprocal agreements with the Bhutanese operators. To use your mobile in Bhutan, you will need to purchase a number/SIM card locally. Your guide should be able to help..
We strongly recommend you take medical advice from your doctor before visiting any part of Asia. He or she will be be able to advise you on the latest health-related recommendations and preventive measures. Water is not usually drinkable in hotels, and we recommend you stick to bottled water which is available everywhere. Clothing to bring & wear. The weather in Bhutan, because of the altitude, is usually cool or cold. However during sunny days, it can feel quite hot due to the thinness of the atmosphere, even though the underlying air temperature is low. We recommend a windproof jacket, and layers of thin sweaters to allow for a range of temperatures. In June-August, the monsoon rains are often heavy. For visiting public buildings, monasteries and temples, shoes must be removed. Shorts, t-shirts etc. are not acceptable: men should wear long-sleeve shirts with collars, and if warm enough for shorts they should be the longer kind. Ladies should wear trousers or skirts to the knee, and have their shoulders covered, perhaps by a shawl or wrap if necessary. Here are some things you should consider bringing: Shower Gel, shampoo, facecloth, travel hair-dryer; sunblock cream, sunhat & sunglasses; folding umbrella; good walking shoes; telescopic walking pole. Visitors to Bhutan very rarely experience crime or other difficulties and the crime rate is still very low. However please take sensible precautions as for any 'third-world' country. Please do not carry passports, important papers or a lot of money when walking in the street: make use of hotel safes where available. Winter: December-February. Winter is very dry, with cold nights. The skies are usually clear allowing the sun to make the day quite warm. Spring: March-May: Warm days and cool nights, the occasional showers cause the land to become green and lush. Summer: June-August: Warm, however the monsoon starts June/July and can be very heavy. Autumn: September-November: Warm days and clear skies make for ideal walking and trekking.